4) positive outcomes, such as policy changes or conservation actions, as a result of research using vouchered specimen data. If you would like to contribute content to the monthly Research Spotlight, please contact us! How can you provide an authentic opportunity for undergraduate students to study geographical variation without hauling them to major metropolitan museums and arranging access to valuable specimens? This question started a slightly obsessive odyssey that began with a single coyote skull and now stands at 125 skulls….and counting. Prologue: Many of us in the ADBC world look for ways to expand the community of users of museum collections data and to increase the ways in which collections data are used. Recently, in Trends in Ecology and Evolution (TrEE), an opinion piece was published by Scott A. Morrison, et al. titled "Equipping the 22nd-Century Historical Ecologist." In this paper, Morrison, et al. iDigBio supported five students in its inaugural mini-REU site program during summer, 2017. This program, modeled on NSF’s Research Experiences for Undergraduates Program, was developed to provide undergraduates with research opportunities using digitized natural history collection data. Data curation profiles (DCPs). DCPs give scientists, researchers, and data managers an enhanced and detailed understanding of the “data story” from the perspective of the data. A DCP “captures requirements for specific data generated by researchers articulated by the researchers themselves” (http://datacurationprofiles.org/purpose) and provides data managers a framework to acquire an in-depth understanding of the particular data curation needs of producers and their intended users. Read more about Wade & Kelly's work with the iDigBio community here. Animal species need space – a place to forage, grow, and nest. This is especially true of Lepidoptera (butterflies and moths), whose caterpillars generally feed exclusively on one genus or species of host plant (think monarch butterflies and milkweed). For the 4,000 or so species of native bees in North America, required forage plants and nesting sites vary from common suburban offerings (e.g., patches of bare ground, maples, willows, clover), to specialized needs which are ecosystem-specific. Enter tallgrass prairie – a grassland ecosystem with high forb diversity that supports a dizzying array of invertebrate life. As our continent’s most endangered ecosystem, the 1-3% that remains is a mix of remnant and restored habitat, and restoration efforts-- both large and small, are ongoing. Read more here. Publishing a new species? Add the unique identifiers! Citation of voucher specimen data can be problematic. There are currently no formulated rules for how to cite a digital specimen in a publication, but data aggregators such iDigBio, GBIF, and VertNet offer suggestions. Pensoft is leading the way by providing efficient methods for publishing digital data (see their blog post here) - but it still rarely happens, or occurs in a non-systematic way. Recently, with my colleague Dr George Argent, a new species of Rhododendron from Mount Yule, Papua New Guinea was published in the February 2017 online volume of the Edinburgh Journal of Botany. The digital data for the isotype housed at the Bishop Museum is available through iDigBio and we wanted to cite this information in the published paper. As a test case, we added the Darwin Core occurrenceID and a link to the iDigBio record page. Read more here. A large portion of my research in The Gelhaus Lab at The Academy of Natural Sciences of Drexel University relies heavily on digitized specimen data and metadata, specifically the who, when, and where of specimen collection. “Big data” research has risen in popularity since high-performance computing has made it easier for researchers to conduct analyses of groups of organisms overnight; however, additional considerations to the use of large datasets should be taken into account. My research focuses on the historical biases present in natural history collection data, including identifying collection bias and gaps in data due to human history. Read more here. This month's Research Spotlight contribution resulted from a recent iDigBio workshop where participants learned the basics of OpenRefine. Finding a limitation to the size of the dataset that could be manipulated, Chris found the following solution to working with large datasets from iDigBio and other biodiversity data aggregators. OpenRefine (formerly Google Refine) is a powerful tool for helping with the cleaning of messy data - ideal for natural history collection managers, data managers, and researchers using biodiversity data alike. Read more here. The Biodiversity Information Standards (TDWG) annual meeting in 2016 had the theme of "Standards Supporting Innovation in Biodiversity and Conservation". Understanding the use of biodiversity standards, and having clear and concise documentation, is essential for the creation, aggregation and downstream use of biodiversity data, and it is exciting to see the diverse TDWG community helping to clarify and expand on the already existing data standards. Read more here. Downloaded data from iDigBio serve as a base for important biodiversity research. It is important to understand how to interpret the way data are represented in the Darwin Core Archives (DwC-A) that you retrieve from our download system either through the portal or the download API. For more information about our data processes and how to use our data, feel free to email idigbio@acis.ufl.edu. Citizen scientists participate in a host of activities that advance scientific research. These individuals are not trained scientists, but their contributions to research enable scientists to scale up their research across taxa and geographies. Read more here. Bees, bees and more bees - or are there? Monitoring the status of US bee populations using biological collections. Sam Droege heads the USGS Native Bee Inventory and Monitoring Lab based at the Patuxent Wildlife Research Center, Maryland, and is working with other researchers to assess the status of bees nationwide. I am currently a third year PhD student at the University of Idaho in the Parent Lab. The Parent Lab studies the biodiversity and evolution of organisms that have recently colonized novel, “blank slate”, environments on islands....read more here. For my PhD research in Dr. Morgan Ernest's lab at the University of Florida, I am using large datasets of occurrence records of native bees and their habitat associations to try to understand native bee biodiversity and foraging patterns...read more here. Jointweeds and Their Many Mating Systems! I’m currently a graduate student in the Soltis Lab in the Florida Museum of Natural History, working on Polygonella(Polygonaceae), sometimes called the jointweeds....read more here. Puerto Rico – warm Caribbean seas, high biodiversity, and coqui frogs. iDigBio was invited to NatureServe’s Biodiversity without Boundaries 2016 meeting in April 2016 to share ideas and resources with members of the conservation community....read more here. 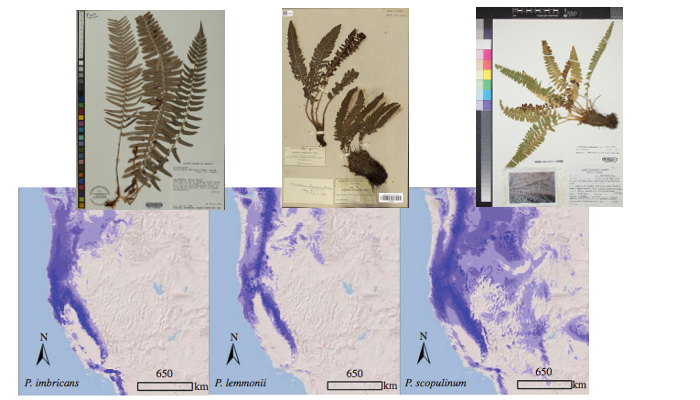 Polyploidy in ferns: biodiversity data documenting speciation! My research for iDigBio addresses ecological and evolutionary questions by utilizing the enormous dataset provided by digitized natural history specimens from across North America. 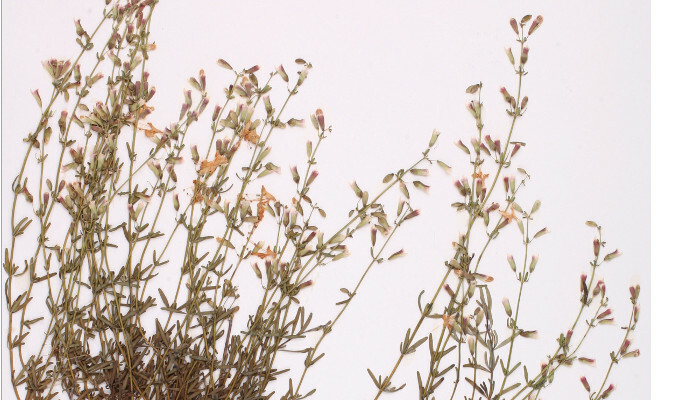 My current project is aimed at investigating the ecological differentiation of polyploid plant species from their diploid progenitor species....read more here. I am a graduate student at the University of Florida, and a member of the Soltis Lab, working on a genus of scrub mints found only in the southeastern United States....read more here. Using distribution models are crucial for estimating levels of biodiversity at the landscape level. Museum specimens are a significant source of information for these models as they witness current but also past habitats...read more here.